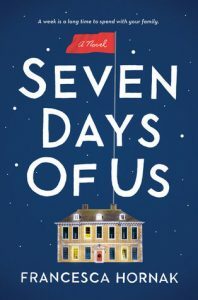 A young doctor assisting in the Haag virus epidemic in Liberia brings home to her British nuclear family (mom, dad, sister) a week quarantine in their country home for Christmas. Secrets burst forth in the form of quarantine gatecrashers, long repressed feelings, and past indiscretions, transforming alliances and long-held opinions. Ultimately, they are closer after a life-changing event in the home. I was thrilled to receive this book through a Read It Forward giveaway, because I otherwise might not have read this wonderful story. This is a superbly written novel, with the only niggle being the chapter headings of intimately specific locations within the house and times given to the minute, which caused me a few times to return to the front of the chapter just to re-read the heading. I appreciate the well-roundedness of the author’s points of views in developing true-to-life characters who interacted in the gray areas of class and social mores in order to relate to each other and grow as individuals to better understand each other on a deeper level. Hornak shows the evolution of all the characters, from the seemingly selfless doctor working in a developing country, who shows contempt for her family, to her younger sister, who is forced to see her own selfishness in order to grow. She also brings us a lovely vision of a blended family, which is one secret I shan’t spoil. Readers who love complex characters who evoke emotional responses, and storylines that reach deeper into concepts that challenge us, will likely fall in love with this novel as I did. The first person to share my review on Twitter or Facebook and tag me will get my copy! After reading, please give it away again. Thank you!